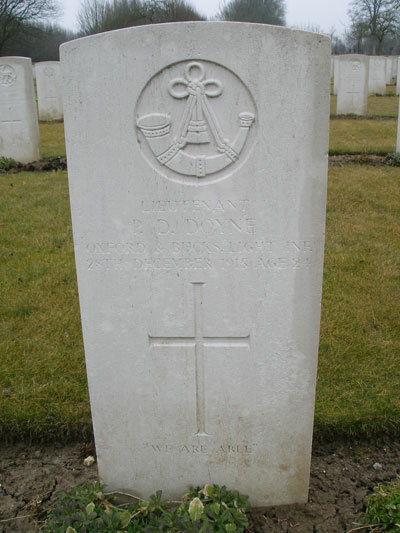 Philip Denys Doyne was born in Horningsham, Wiltshire on 28 October 1891, the son of Philip Valentine Doyne (born at Barrow Gurney, Somerset on 14 February 1859) and Mary Elizabeth Johnson (born in Durham in 1864). At the time of her marriage Philip’s mother was living at Bacup, Lancaster with her father, the Revd W. Johnson. Eric Dermot Doyne (born in Beckley on 4 February 1903 and baptised there on 10 March 1903). The 1891 census shows Philip’s parents living at the Curate’s House, West Common, Horningsham with two servants. Philip, their first child, was born shortly after the census, probably in this house. Philip’s father was Vicar of Beckley from 1894 to 1916. At the time of the 1901 census Philip (9) was living in Beckley vicarage with his father Philip (42), his mother Mary (36), his sister Faith (7), and his great-uncle the Revd Robert E. Richards (69), who was described as feeble-minded. The family had two servants: a cook and a housemaid. Philip was educated at Lancing College, where he was in Olds House from September 1905 to December 1909. He was matriculated at the University of Oxford from Keble College in 1910. At the time of the 1911 census Philip (19), described as a student, was at home in Beckley vicarage with his father Philip (52), his mother Mary (46), and his brother Eric (8), plus one servant. His sister Faith (17) was boarding at a state secondary school run by the Sisters of Mercy at 62 Woodstock Road, Oxford. Philip obtained his B.A. in 1913, and then held a mastership at Winchester House in Deal for a year. He was about to start at Ely Theological College when the First World War broke out, and instead he deferred his place and volunteered to serve immediately. 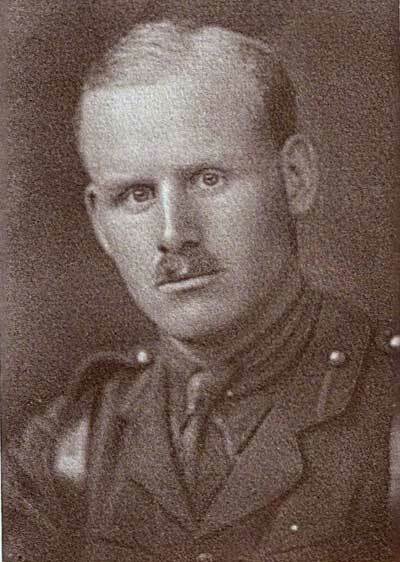 Philip Denys Doyne had joined the Officers’ Training Corps at Oxford and commenced his war service in September 1914. He was commissioned as a 2nd Lieutenant in the Oxfordshire and Buckinghamshire Light Infantry and was promoted to Temporary Captain on 13 December 1914. He went to the front on 3 August 1915, and on being posted to the 1/4th Battalion he relinquished his temporary rank on 22 August to enable him to serve at the front. He was promoted to Lieutenant on 10 September 1915. On 28 December 1915 he went back to France after a short leave home and on the night of his return, when out on patrol in Hébuterne examining the wire in front of the German trenches, a German machine gun opened fire and he was killed instantly, aged 24. Administration of his will was granted to his father, the Revd Philip Valentine Doyne, on 2 February 1917. He left £98 0s. 3d. Philip Doyne’s father did not become Vicar of Holy Trinity Church until 1916, and so he presumably did not move into Headington Quarry Vicarage until that year, just after his son Philip’s death. It is therefore likely that Philip himself had no connection with Headington Quarry, and he may only be included on the church roll of honour as a courtesy. Philip Valentine Doyne remained Vicar of Holy Trinity Church in Headington Quarry from 1916 until his death on 26 September 1923 at the age of 64. Mrs Mary Elizabeth Doyne died on 14 November 1929 at the age of 65: she was then living at 31 Woodstock Road, Balsall Heath. Both Philip & Mary Doyne are buried in Holy Trinity churchyard in a double plot together with Robert Walter Doyne (Philip junior's uncle, who was founder of the Oxford Eye Hospital) and his wife. There does not appear to be any mention of Philip junior on the grave. Faith Doyne (born 1893) married Charles Ivan Herbert (an Army officer based with the Small Arms School Corps in Hythe) at Holy Trinity Church in Headington Quarry on 7 December 1922. The following are likely to be their children, as the mother’s maiden name matches: Ann U. Herbert (reg. Elham 1925); Gillian M. Herbert (reg. Warwick 1927); and Susan P. Doyne (reg. Birmingham 1932). She died on the Isle of Wight at the age of 92 in 1896.